Remember our May Design Challenge with Bucketfeet, the company who works with artists to create amazingly unique shoes? 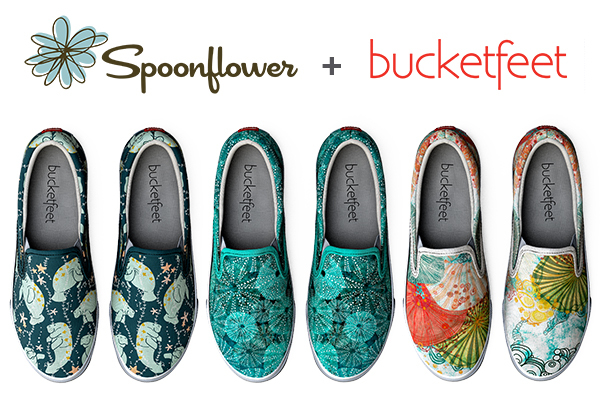 Well, they decided to feature not just the winner but three Spoonflower designers in this limited-edition oceans-themed footwear line! 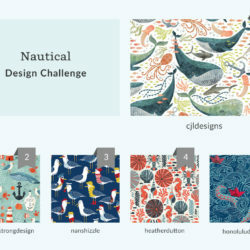 Not only are they offering the winning design, Under the Water by lavish_season, but they also included two more Design Challenge top 10 finalists in this capsule collection: Oh, the Hue-Manatee by spottedpepperdesigns and Life at Sea by mimipinto. 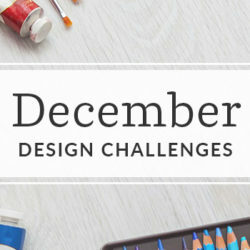 We’re so thrilled to see these designs come to life! 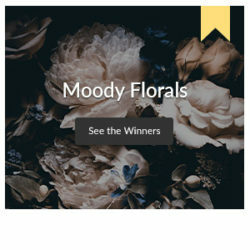 Read on to get to know each of our talented designers whose designs will be featured. 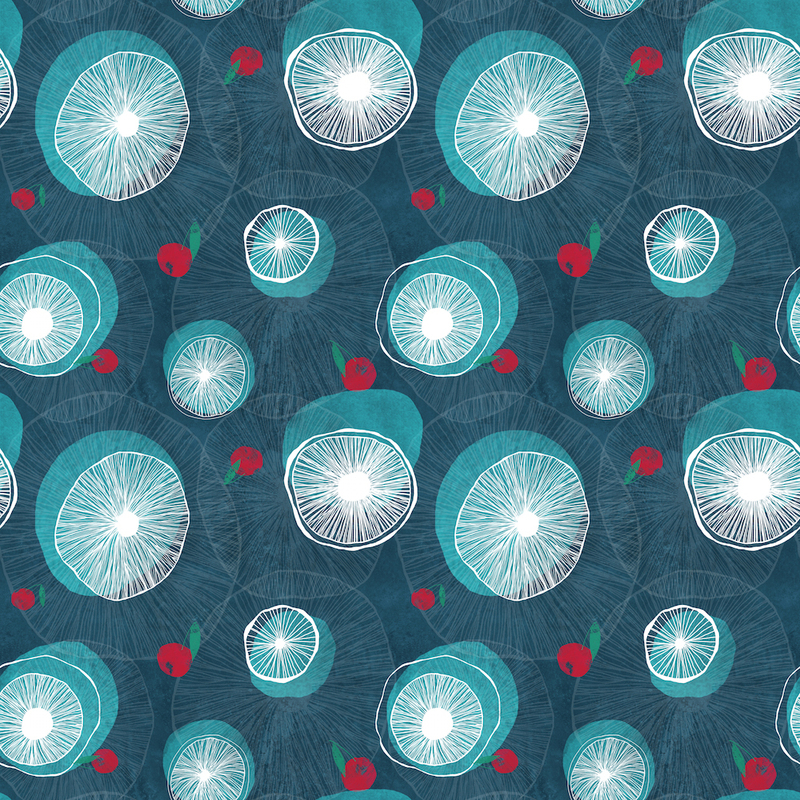 My whole life I have always loved surface and pattern design. 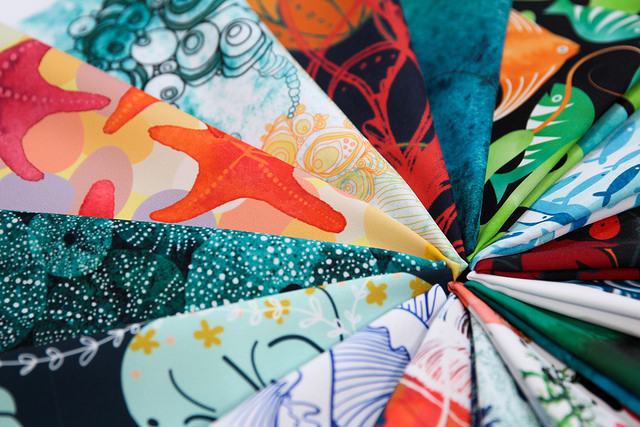 My mother has been active in the quilting industry designing sewing patters since my childhood, so I grew up knowing all the names of the big surface designers and following their work. I have always been drawn to doing it myself someday. In 2009 I moved down to the Florida panhandle and Alabama area and fell in love with the friendly southern culture, new experiences, and good food. While I was there, I was totally bewitched by the manatee! I feel like we’re spirit animals, really. They’re happy, friendly, and love to eat. I’m happy, friendly and love to eat… It was a match made in heaven! Probably a forever bond that won’t be broken. When I start a new fabric design, such as Oh, the Hue-Manatee, I do a lot of research into it. I spend days to weeks (depending on deadlines) looking into designing a new and unique print. I always want my art work to be fun, light spirited, provide a story. Sometimes maybe it will even make you chuckle! 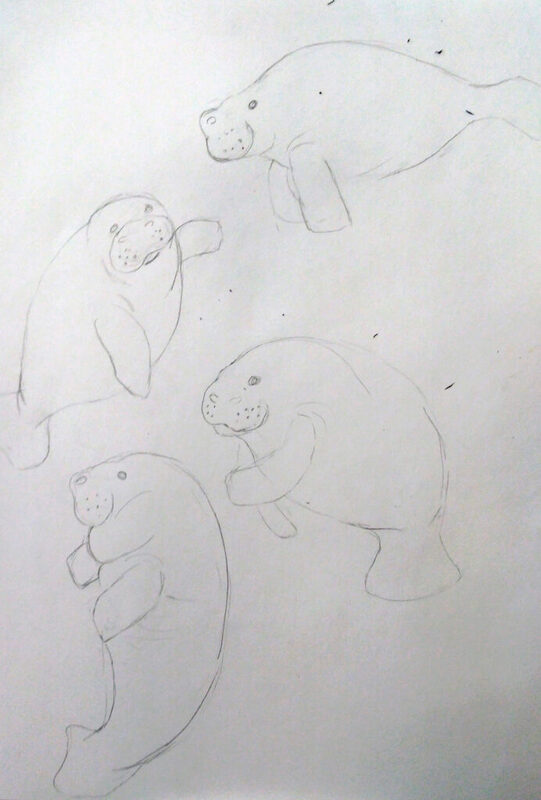 After compulsively studying manatee characteristics for a few weeks (and loving every single second), I drew up some sketches of my happy sea cows. 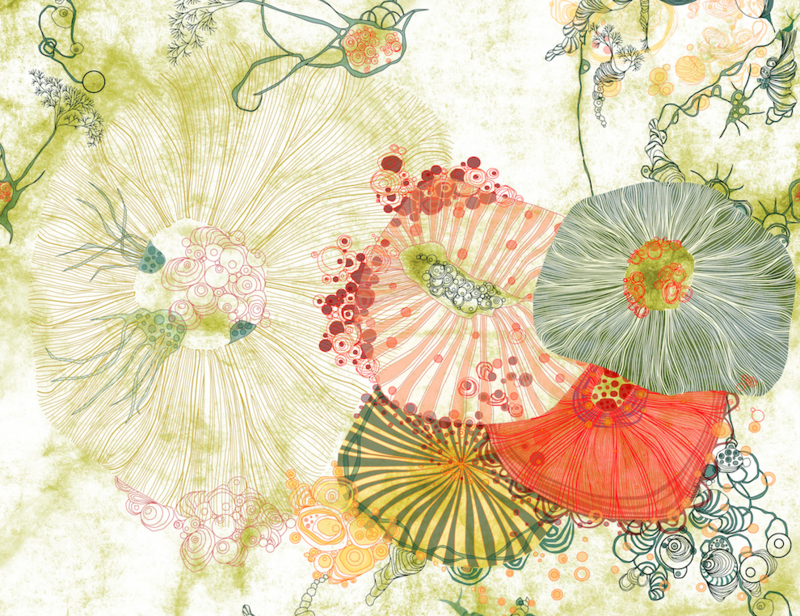 I like to do 3-9 variations of the same illustration for my fabrics to really create a seamless feel. I also use smaller elements, such as bubbles, sea grass, and starfish for depth and character. Once everything is vectorized in Adobe Illustrator and placed appropriately, I pull up my favorite color pallets. My color pallets consist of pre-selected colors I have pulled from photography or I believe would go well together. This part is always fun with possibly a pinch of challenging. I usually know that I have created a great pattern when it looks fantastic in multiple color ways. This is the challenging part because I have to pick my favorite and that’s like asking me between key lime pie or tacos. I would settle for both if it was possible! I am also fabulously lucky to have a great tribe who is always willing to help a girl out when she just can’t make up her mind. 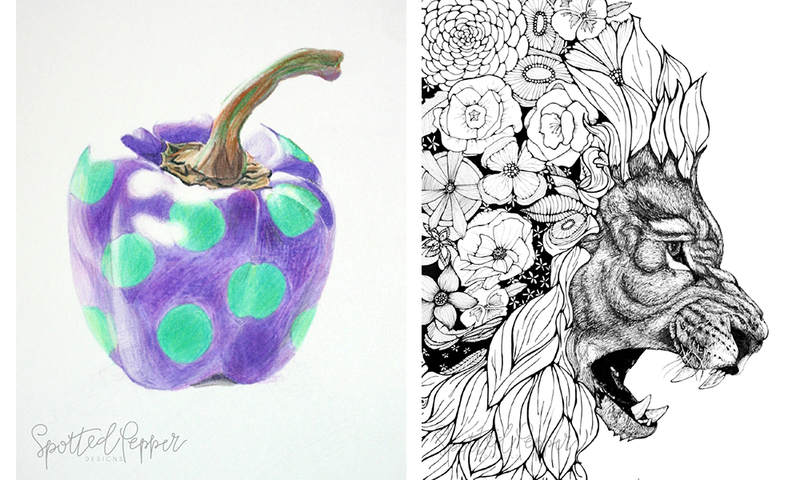 When I am not creating fabrics I enjoy creating fine art in pen and ink or Crayola twistables. Hey, I’m a mom, I gotta do with what I have! I love creating elements that wouldn’t typically go together. Such as a lions mane made out of flowers, or peppers with polka-dots! 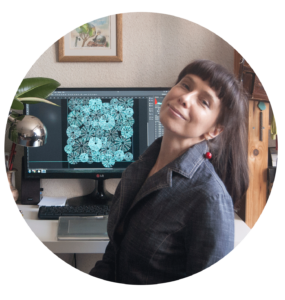 Our northern-most designer, Inga, hails from Daugavpils, a small town in the southeast of Latvia, Europe. 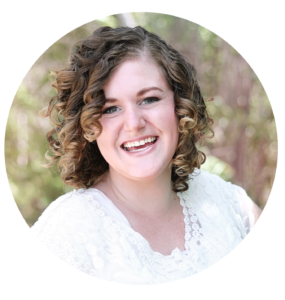 In her own words: “I’ve opened my shop on Spoonflower about a month ago. 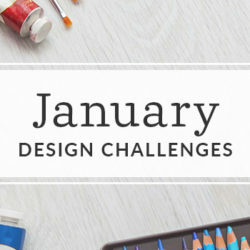 I decided to try to create a design for fabric and take a part in this wonderful challenge. I fell in love with design when I spent my summertime in my childhood in the countryside or on the sea coast. 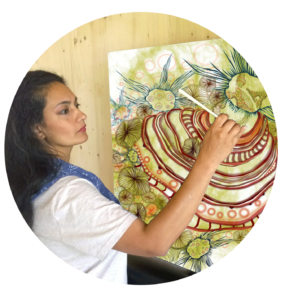 I was inspired by beauty of the nature, weather, sea or forest smells, magic of floral world and communication with the animals. Nature inspire me every day. I’m keen on photograph and like to spend my free time in the forest. I am first A Mom, to three adorable kids, that are both, rascals and angels at the same time, secondly I am an Artist and Designer Maker of fibre art and sculpture. Trained in Fashion and Textile Design. I remain passionate to my roots of pattern and design. I live with my family in Rural Kent known as “The garden of England” which is an inexhaustible source of amazement and inspiration for my work. 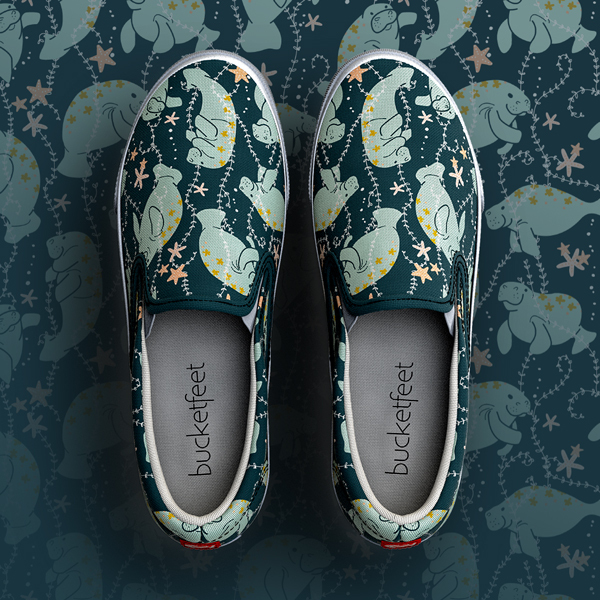 My design for the Spoonflower and Bucketfeet collaboration Themed Oceans evolved from my interest and intrigue in evolutionary biology and speciation where beauty evolves in the most fragile and hostile of environments, weird and wonderful organic life forms emerge and thrive. My Spoonflower shop is filled with designs that fit my design aesthetic: quirky, layered, organic, style, that is playful & rich in colour. Spoonflower employees rocking our Bucketfeet shoes! We’re so thrilled to see these designs come to life; plus each of these artists receives a portion of the profits made from their designs. As all of us in the Spoonflower offices can vouch, Bucketfeet shoes are suuuuper comfy and fit true to size. These limited-edition kicks are only available for pre-order for two weeks, so support our designers and reserve yours before they are gone for good! I have a store in Crystal River Florida. Would like to sell your manatee shoes. Are you wholesale? We’re so glad you love the manatee shoes! They are sold directly through Bucketfeet so we suggest that you could contact their support team directly.